I realize my handwriting in this is atrocious. My apologies. Please don’t be angry. This is a modern Aurora, and looks far different than the older-style Auroras that are still available. Cats are inconvenient when you’re trying to write or type, but that’s half the fun of having them. 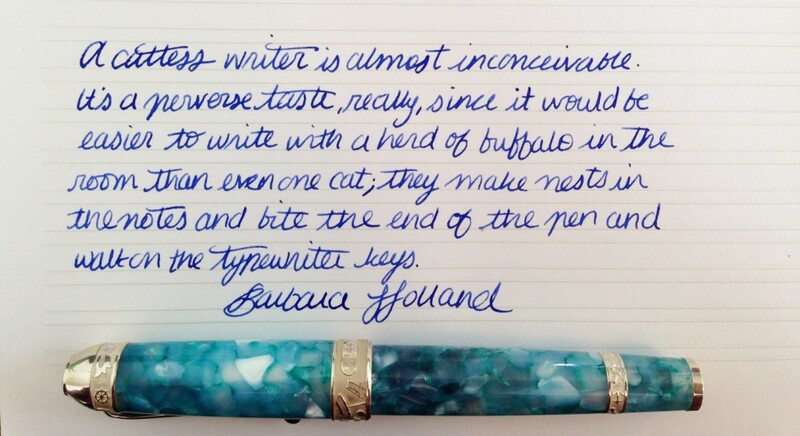 It’s cute until they start biting your fountain pens, anyway. I keep hearing Aurora made some great pens, so I’ll have to scope them out. This entry was posted in Vintage Pens and tagged Aurora, Handwritten Post, Quotes. Bookmark the permalink. Follow any comments here with the RSS feed for this post. Post a comment or leave a trackback: Trackback URL.